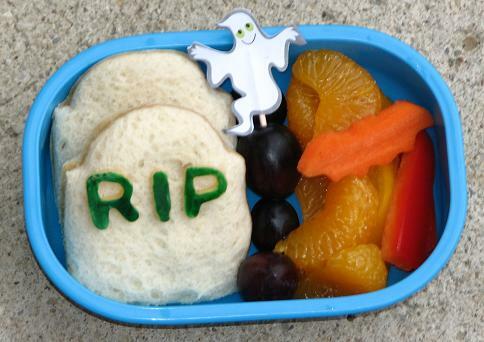 I was going to do a whole week of Halloween bento and then Kidlet got sick. He is missing out on Trick-Or-Treat and everything, poor thing. This is the bento from last Friday that I never got around to posting. I'm not happy with the giants gaps here that I didn't see. I usually do bento in the evening but this was an early morning one so I guess that's how it goes! Kidlet has two tombstone peanut butter and honey sandwich, RIP in cheese with food color markers, grapes with ghost skewer, mandarin oranges, bell pepper, and carrot bat. I have two days left for fun Halloween bento so I think tomorrow will be Great Pumpkin and then something involving the pumkpkin cream cheese I made. Fun! yikes! I hope he feels better soon! like the ghost, hopes he gets better to have at least a short walk around the block.